There are two reasons to stop by this temple. 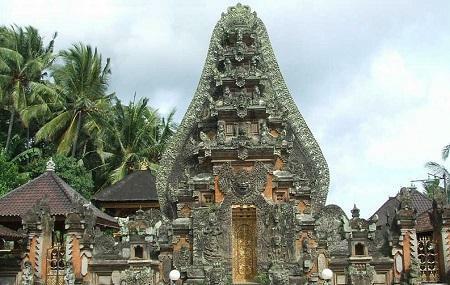 The first is the fact that this is a temple dedicated to the dead, of which there are very few in Bali. Specifically it is dedicated to the guardian spirit of the dead, or Merajapati. See the fine carvings of the Hindu deity Durga on the temple walls near the gate. Inside, you’ll find much scarier images - battles with demons, the murder of babies and so on. The second reason to visit is the view. The temple faces the rice terraces of Bukit Jangkrik, and such sights are among the prettiest in Bali. There is nothing much else to do here so click a few pictures and move on.